Change is the only constant, it is often said. But nothing in the world is as simple as a cliche. We must dig a bit deeper if we want to get closer to the truth. What kind of change are they talking about who speak of constant change? Is it only an outer change? Or only an inner change? Or both? Who or what makes the change possible? Does it happen on its own? Or does someone or something compel or force or push for a change? Is change a natural phenomenon? Or is there another master-plan working behind the surface phenomenon of Nature? What is the outcome of change? Is it always for the better? Can change also be for worse? What distinguishes a good change from the one that is not? Who decides what is a good change and what is not? Who decides what is good, period? So many questions. And I am not done yet. There is also the question of why. Why does change occur? What is the need for change? Why can't things stay the same? Is there a plan being unfolded through all the changes we see happening around us? Can we ever know that plan? Or even get a glimpse of it? I am not sure I or any of us can have the complete answers to any or some of these questions. I am not even sure if I have all the questions yet. But sometimes you don't need to have the answers. Or at least not right away. You just need to keep asking the questions. More questions. So that you don't believe anything just because it is told to you by an authority, by your textbook, by your teacher. Change maybe a constant. But perhaps so is Beauty. So is Joy, and so is Delight. This may not make any sense the moment we start looking around and see all the horrible stuff happening. In our lives, individually and collectively. In our homes, in our communities, in our worlds. Where is any Beauty in all the gross, all the terrible, heart-breaking, horrendous human behaviour that we witness all around us? Where is the joy, the delight in any of that? But where does it all take us? Do things ever change? Does the system become better? Does the horrible stuff stop? Or does one kind of terrible replace the other? And a time comes when we start using another cliche - the more things change the more they stay the same. If all change leads to only more of the sameness, why change in the first place? So we are back to not really knowing anything. Not really having any answers. And yet we must continue. Continue asking the questions, continue living the questions. With the hope that someday we will be able to "see" the truth, not in a book or in a system or in a religion, but within. Change, but not for the sake of changing. Change, for evolving, progressing, transforming. Change, for constantly discovering beauty, joy, and truth. but rarely admit the changes it has gone through to achieve that beauty. Linking this post with Write Tribe Wednesday Prompt: Write a post inspired by a Maya Angelou quote. The quote I have chosen is not exactly a quote on writing, as per the prompt guideline. 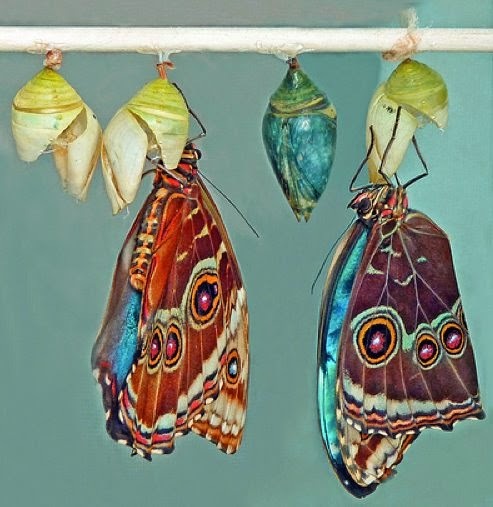 But on some level, everything in life has a connection with writing, including a butterfly's beauty and change.